We are a leading Manufacturer of brake shoe grinding machine from Pune, India. 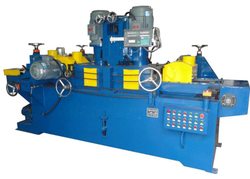 Brake Shoe Grinding Machine useful to grind brake shoe linear & maintain quality within 0.04 (40 micros) shoe grinding machine available in manual loading /unloading of shoe or automatic loading with the proof testing arrangement. Looking for Shoe Grinding Machine ?